If you love Tears in Heaven by Eric Clapton, than you’ve got great musical taste. This is one of those songs that become classics for generations to come, all the better reason to learn it well 🙂 The song won 3 Grammy awards, and was at the top of the charts for several weeks. The song has a very tragic story though, which you should be familiar with. Clapton’s 4 year old son fell out of the window of their New York City apartment, and the song is about the pain and loss Clapton feels following the tragic accident. Our Tears in Heaven guitar lesson will teach you how to play the entire song, with the exception of a couple fill-in parts played by the 2nd and 3rd guitar. The video tutorial is very dense and has a lot of information, so make sure you download the tabs/chords PDF and the Guitar Pro file for Tears in Heaven after logging in. You’ll start out by learning the intro and the verse, which is actually the main melody of the song, the jingle that everyone is familiar with. You’ll learn a couple of interesting chords and fingerpicking patterns along the way, so make sure you spend enough time on this part of the lesson. Note that the beginning of the verse is exactly the same as the intro. Next, you’ll learn the chorus to Tears in Heaven, which is made up of chords and a set picking pattern throughout this section of the song. 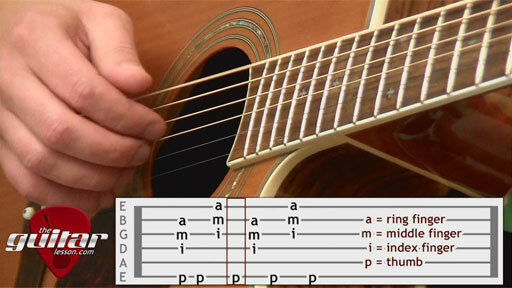 And after the chorus, you’ll learn the bridge as well, which is made up of a few extra chords. Now as I said, there are lots of chords to learn in Tears in Heaven, but I’ll show you how to change from one to the other in the best way possible, so you’ll be able to learn the chord progression quickly. Getting the actual chord changes perfected will take a bit more time, so be patient, keep practicing them, and you’ll get it soon. Tears in Heaven was released by Eric Clapton and co-written by Will Jennings in 1992. It was first released on the soundtrack of the film Rush, than on the classic Unplugged album. We’ve already discussed the tragic nature of the song, with Conor’s death. Eric Clapton hasn’t played this song live since 2004. Performed by a large number of artists, including an all-star cast assembled by Ozyy Osbourne (which included Steven Tyler, Pink, Slash, Robbie Williams, and other famous artists), Paul Anka, etc. Sorry, but you've reached a premium content area. The download of the Tears in Heaven tablature file is only available to premium members. Sorry, the same goes for the backing track. To download the backing track to Tears in Heaven, please log in and revisit this page.